This Summer you will be able to make the most of your Castel camping holidays and find relaxation and enjoyment ! Ideally, if you still have some room in your suitcase make sure you add a few small, easy to pack games. Mölkky: invented in Finland, this game is suitable for everyone, regardless of age. The basic principle is rather simple, one has to knock down wooden skittles, which are arranged in an upright position on the ground by means of a throw called Mölkky. The skittles are marked from 1 to 12, the first team which reaches 50 points wins ! 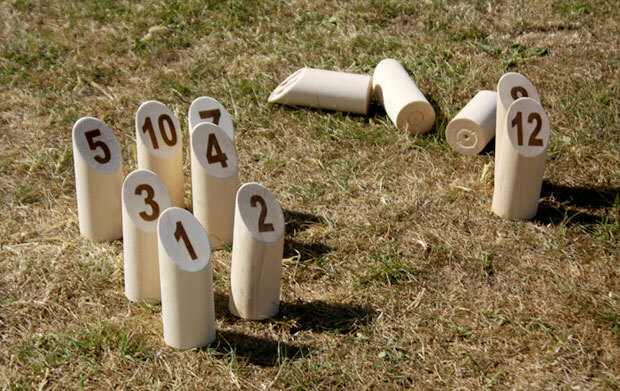 Its in between petanque and tenpin bowling, Mölkky could well become your favourite game of the holidays ! Slacklining, also known as a sport, it is similar to slack rope walking and tightrope walking: the objective is to walk or balance on a suspended length of flat webbing 5cm wide (adapted for beginners). Work on your balance and take your first steps surrounded by the perfect environment of the Castels campsites. Jokari, an outdoor game for children, which is rather like the traditional Basque pelote. A game, principally for two players but it can also be played solo or with the family.The equipment is available in stores, so don’t hesitate to get yourselves a set, you can be sure it’s a lot of fun, and good exercise. The Frisbee, It’s irresistible when spending days on the beach ! Several players can participate in the one game, this light flying disc allows you to make the most of the wide open space. You can really let off steam with this one ! Memory game giant size ! Try and create a memory game, by drawing on sheets of paper images and symbols and place them face down. Applying the same rules as a classic memory game, except that the participants have to physically move around the game ! The more sheets of paper and the more they are spread out, the more challenging it becomes ! Giant Mikado, this famous game of precision and concentration is also available in a XXL version ! It consists of long bamboo sticks and requires an amazing amount of patience ! Gyropode, Gyroscopic self-balanced scooters its more than a game and it has real means of transport ! Its up to you to be creative and to invent rules around this single person, self stabilized electric vehicle with one or two wheels. Depending on the region of your holidays, we suggest you rent a gyropode and discover the most beautiful landscapes in France !